Ebola: Should I be worried? Worried – no. Informed – yes. West African countries affected by Ebola. so disregard any thoughts of The Last Ship (www.tstdrama.com/TheLastShip) scenario playing out any time in the near future. 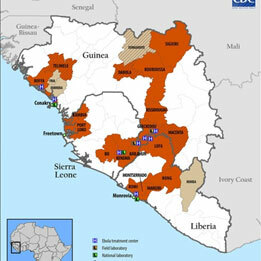 Presently the Ebola outbreak is concentrated in West Africa, specifically Guinea, Sierra Leone, Liberia, and Nigeria. That’s approximately 5,000 miles away from The Ohio State University. That being said, with the ease of travel these days, someone could be in West Africa today and on campus tomorrow, so it’s good to be informed. The incubation period, that is, the time from contact with the virus until symptoms occur, is usually 5 to 7 days but can last as long as 21 days. Individuals with no symptoms are not contagious. If you have been in direct personal contact with anyone who is from or has traveled to one of the West Africa countries listed above or have handled an animal from one of these countries and you experience these symptoms, seek care at the Wexner Medical Center. Careful attention to hygiene. Avoid direct contact with blood and body fluids. Do not handle items that may have contacted infected person’s blood or body fluids. Avoid contact with animals or raw meat. Avoid foreign hospitals where Ebola patients are being treated. The US Embassy or consulate can provide information on facilities that are suitable for your needs. Monitor health for 21 days if you were in an area with an Ebola outbreak . Edited by Tina Comston, M.Ed. Reviewed by Mary Lynn Kiacz, M.D., Gladys Gibbs, M.D. ← Help! I found a tick on me! Am I going to get Lyme Disease?